I’ve had dental crowns before but they’ve always been on back teeth. This is my first one on a front tooth. My dentist did a CEREC crown which was very convenient. I liked that, but for some reason it looks really fake compared to the tooth next to it. It almsot has a painted, dull appearance. Is this typical of crowns? Is there a way to get them to look natural? CEREC crowns are made of all-porcelain, which is great. Porcelain mimics the appearance of natural teeth by reflecting light. 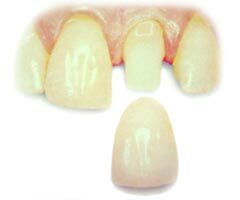 When you get traditional porcelain veneers, they are milled from several different blocks of porcelain. Our natural teeth aren’t the same all the way down. If you look closely at your front teeth the bottom parts of your upper front teeth are more translucent than the middle parts of your teeth. Even though it still requires an expert cosmetic dentist to place a dental crown on your front teeth, traditional all porcelain crowns are a little easier simply because they’re milled from several block of porcelain making it easier to get the different levels of opacity versus translucency. With CEREC crowns, this is more challenging. They are milled from a single block of porcelain. That makes it harder to show the subtle differences in color. Dentists have to be very familiar with color theory and stains to get a front CEREC crown to look natural. Without that, you end up with a flat looking front tooth as you’re experiencing. Which Dentists Can Place a Crown on a Front Tooth? Front teeth are more exposed, making it imperative the dentist has the right skills to match and blend the crown with the adjacent teeth exactly. In your place, I’d only use an AACD accredited cosmetic dentist. Dentists who’ve reached accreditation are the top cosmetic dentists in the world. You can go to aacd.com to find one in a reasonable distance to you.